THIS IS THE RETURN OF THE HOLDSWORTH GROUP THREAD!!! EDIT: I've tried to edit the title of this thread to reflect the new HH headless Allan Holdsworth models. Hopefully others will see this and discuss those models in this thread as well, when they start hitting the streets. This is the place to discuss, celebrate and ask question/learn about these great guitars. Also a place to share pics - that doesn't have to be reserved for the Photo Gallery part of the Forum! Allan Holdsworth and the folks at Carvin are certainly the experts on these guitars, but I've had FIVE different Holdsworth's in my possession, so I think I also know a little bit about how they work, how they sound, and what kinds of mods can take them to another level (or just make them fit your sonic/tone needs). The other two were, unfortunately, sold to raise funds for other guitars (among them, a couple Carvin DC150's ... but that's for another thread). I tried a couple months ago to buy one of them back, but the new owner wasn't interested in selling - oh, well! 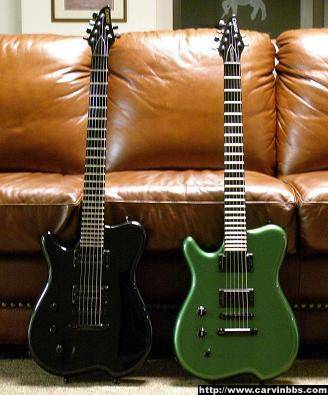 As this thread develops, I'll share tonal impressions, mods I've done, and options I hope Carvin will offer in the future (one option which I hope to order on my next Fatboy...). I hope you'll share your Holdsworth experiences here as well, and let us in on how you've tweaked yours to meet your creative needs. ...can't wait to see it when he gets done with it. I gave him a few ideas about colors and graphics - we'll see what he comes up with. It will be a total surprise. And I have no idea when he's going to get done...it's being done as a gift, so he'll work on it as he has time. I do miss my Fatboy though, especially since I also don't have my other Holdsworths anymore! 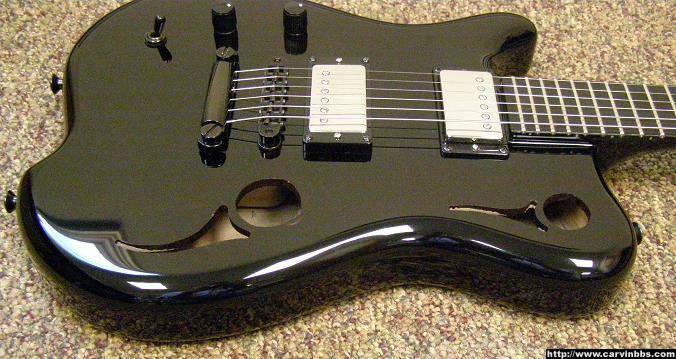 I've also modded the Fatboy - and most of my other Carvin's - with aftermarket pickups. I've used lots of DiMarzio's, I may try some others in the future, or, on my next Fatboy, I may just leave the H22's in; I really like them...I just can't help but tweak some things! 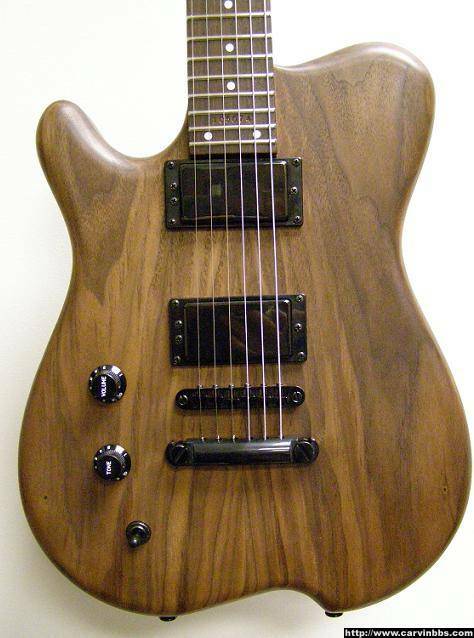 It will be interesting to compare this one to my old Fatboy, which is made of the standard neck and body woods. I'm thinking mahogany will warm it up a little...I've even thought of doing a rosewood board for more warmth, although I don't think the fingerboard makes a significant difference in the tone. Other than that, being semi-hollow too.. Just adds up to an amazing guitar, despite how Im not a huge fan of the shape, although its growing on me. 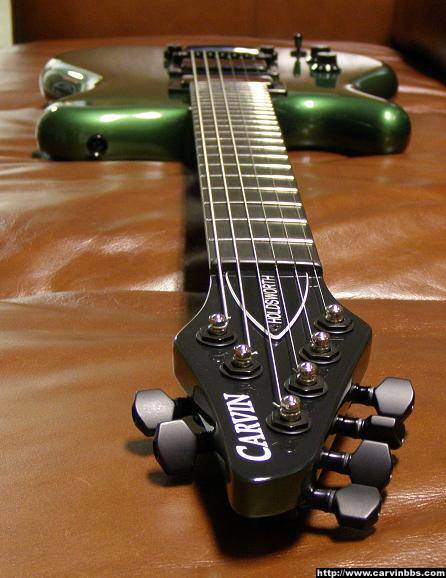 BTW: Does Carvin still make H2T's??? Doesnt give me the option to add a wilkinson on the main HF2 page anymore.. Hmm. The Fatboy doesn't have the option of adding a Wilkinson (or Floyd) trem because of the hollow body and the "rails" down the middle of the body. You can only do a Bigsby on the Fatboy (and that's only for right-handed models). 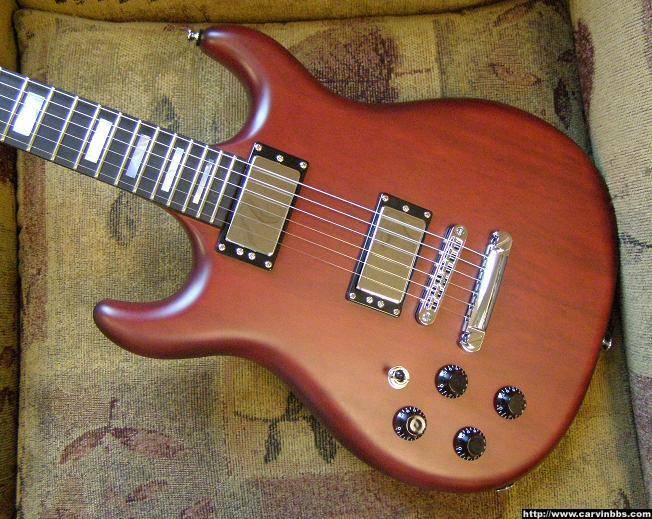 but they used to make the semi-hollow ones with the wilkinsons, if im correct.. just dont do it anymore. 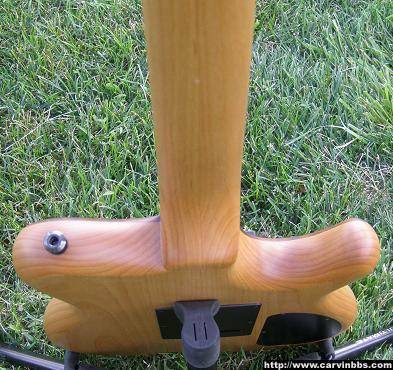 Well, the H2 is also "semi-hollow" - the body has chambers in it, but it has solid wood in the middle so that a tremolo unit's springs can be secured; the Fatboy's design doesn't allow for a place to secure the trem springs - so the Fatboy has never had a trem option, other than the new Bigsby option that was added about 6-12 months ago. Just went through the Carvin Gallery and found a few interesting Holdsworth pics that might be helpful for people wanting different ideas about the guitar and various options. I'll break these up into a few posts so this doesn't get to be a long post. 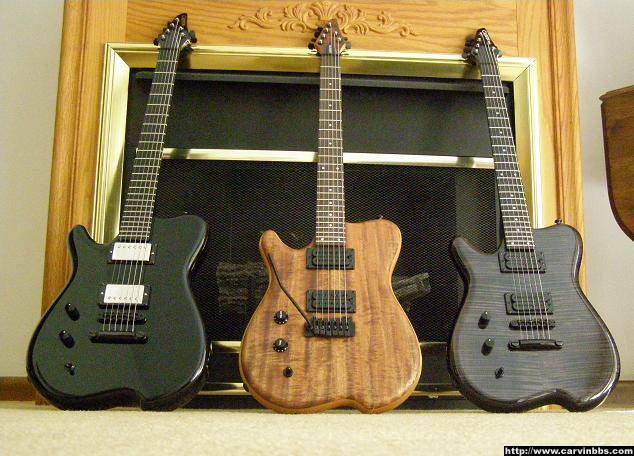 These first two are the only ones I've seen with non-Holdsworth headstocks. I'd like to see a Holdsworth with the standard 6-in-line and also the new TLB headstock as well (if someone wants to do a couple photoshops!). I like the pickup selector switch on the upper bout on the HF2S - if you're used to an LP, this would appeal to you. 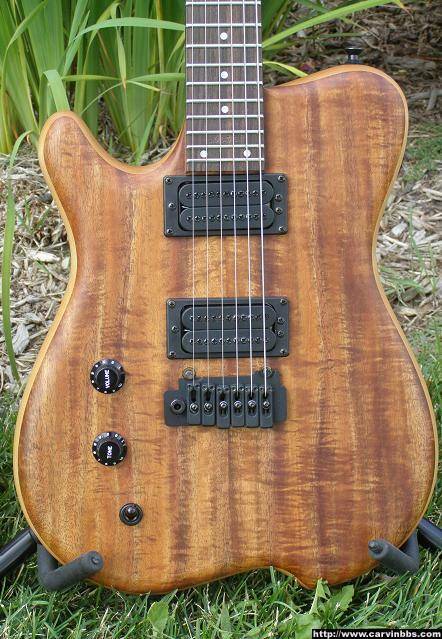 Great thread, thanks - I have an H2T on order, delivery in June - alder/alder, spalted maple top, black hardware, ebony FB no inlays, coil splits, phase switch, TUSQ nut, gloss body/satin back of neck, will post photos when it comes. Thanks for the great pics. Have one on order (see below). My desire would be to have the H2T available with MIDI and the piezo Wilkie but everyone I talked to at Carvin said this just couldn't be done. If i like the one I've ordered may get a Fatboy with MIDI/piezo but wish I could have all in one. 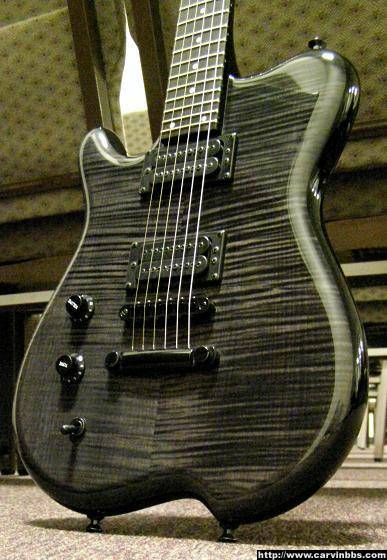 brent wrote: Great thread, thanks - I have an H2T on order, delivery in June - alder/alder, spalted maple top, black hardware, ebony FB no inlays, coil splits, phase switch, TUSQ nut, gloss body/satin back of neck, will post photos when it comes. That should be a beauty - it will be similar to the one pictured above. Do you have any other Carvins? Ever played one? The necks are incredible. And the H2T in alder is a very light, resonant guitar. I remember someone on here saying that he owned both a Fatboy and gibson ES-135 and that the two sounded very similar. For you who own both the Fatboy and the and the H2... how similar in sound are they to each other? Will be first one I've owned, have played a couple owned by friends. The quality you get for the cost from Carvin is amazing, this guitar at about $1500 is only $250 more than a garden-variety Stratocaster for gosh sake. ElfDude wrote: I remember someone on here saying that he owned both a Fatboy and gibson ES-135 and that the two sounded very similar. They sound very similar plugged in...I don't think anyone could tell the difference in a blindfold test. I was surprised when I got my first H2 (after having owned a Fatboy for a couple years) at how hollow it is inside. Smaller and thinner than the Fatboy, but still it's as hollowed out as any of the SH550/SH445/645 Carvins, and actually MORE hollowed out than the AC175 and 275! This also makes for a very light, comfortable guitar, with lots of resonance. The Fatboy feels quite a bit heavier and builkier in comparison, while having the same tonal characteristics (to my ears). mikeymac wrote: but still it's as hollowed out as any of the SH550/SH445/645 Carvins, and actually MORE hollowed out than the AC175 and 275! Wow, and consequently more hollowed out than my AE185 as well! Interesting and intriguing! Yeah ... an alder body and neck on an H2 make for a very resonant, light guitar; I could always feel mine vibrating all over when I strummed it. And it doesn't really seem to matter what the top is (mine was flamed koa); the rest of the guitar is very sensitive to the vibration of the strings.